So, what is this silly-looking thing and what is it doing between the theropod-like prestosuchids and the equally ferocious-looking rauisuchids? Perhaps its some kind of anachronistic cross between an aetosaur and an armadillo. Truthfully, neither we nor anyone else has a firm idea. Its not even completely clear that Doswellia is an archosaur. It has palatal teeth and not a trace of a lower temporal fenestra. It may or may not have an antorbital fenestra, since that part of the skull is unknown. So are the critical ankles. The pelvis is not much like other archosaurs. The dorsal ribs are not much like any other known tetrapod. Although bits and pieces of Doswellia-like material (mostly scutes) are widely known, only one (or one and a half) articulated skeletons have been recovered. Generally speaking, it has enough archosaur-like characteristics that it is probably an archosaur. But, as we saw with Ornithosuchus and Sinraptor, appearances can be quite deceptive in the absence of firmly established synapomorphies. At least one, and perhaps two, new Doswellia papers are said to be in process, so nothing much is gained by speculating. We will simply have to wait and see. ATW040130. Phylogeny: Rauisuchia ::: (Rauisuchidae + Poposauridae) + *. Characters: ~2 m, with head 15 cm [W80]; skull sculptured, akinetic [W80]; narrow, elongate rostrum [W80]; subnarial fenestra absent (reversal) [π$03]; orbits dorsal & closely spaced [W80]; frontals & parietals very narrow [W80]; postfrontal absent [π$03] [W80]; postparietals absent [W80]; occipital margin of skull indented on either side of midline [W80]; jugals expanded & enlarged; postorbital-jugal bar with distinct "step" [π$$$03]; lower temporal fenestra reduced & triangular, or absent entirely [π$$03] (completely absent and cheek bones tightly sutured in Doswellia [W80]); squamosal overhangs quadrate & quadratojugal but excluded from lower temporal fenestra [π$$03]; squamosal, postorbital & parietal surround UTF [W80]; squamosals form prominent posteriorly-directed "horns" [W80]; quadratojugal participates in jaw joint [W80]; quadrate with prominent otic notch [W80]; quadrate wide & massive, with anterior process along quadrate ramus of pterygoid  [W80]; supraoccipital with small, posteriorly projecting exposure on skull table [W80]; exoccipitals close, but not in contact dorsal to foramen magnum [π$03]; exoccipitals & opisthotics fused in paroccipital process [W80]; paroccipital processes dorsoventrally narrow & without great distal expansion [π$03]; posttemporal fenestra reduced to foramen [π$$03] in fact absent [W80]); depression for posterior tympanic recess on anterior face of paroccipital process [π$03]; stapes lies in well-developed quadrate notch [W80]; stapes with elliptical foot plate & without arterial foramen [W80]; dorsum sellae bears prominent clinoid processes which partially encircle the trigeminal foramen [W80]; basipterygoid process surrounded by pterygoids [W80]; ventral epipterygoid plate ossified and sutured to pterygoid plate [W80]; laterosphenoid absent & no other ossified braincase elements anterior to basisphenoid [W80]; interpterygoid vacuities absent [W80]; pterygoid flanges wide & thin [W80]; articular with dorsomedial process on posterior end [π$03]; dentaries fused at symphysis, with bulbous expansion anteriorly [W80]; jaw deep posteriorly [W80]; articular & angular both contribute to jaw articulation [W80]; surangular convexly curved on dorsal margin, matching opposite curvature of jugal and quadratojugal [W80] ; articular forms wide socket for quadrate, strongly restricting lateral mobility of the jaw [W80]; retroarticular process prominent [W80] ; palatal teeth present (reversal) [π$03]; pterygoid with three rows of short, blunt teeth [W80]; marginal teeth thecodont, homodont & probably recurved [W80]; dentary with 33 tooth positions, becoming progressively smaller posteriorly [W80]; body elongate and flattened [W80]; vertebral count 8?+14+3 [W80]; centra amphicoelous [W80]; cervical neural spines low anteriorly, rising rapidly [W80]; neck elongate [W80]; cervicals elongate & without ventral keel or intercentra [W80]; cervical ribs present, very wide, but thin, with short necks [W80]; cervical ribs with sharp posterior bend, posterior arm having rugose area for armor attachment [W80]; presacral & 1st sacral ribs 2-headed, others single-headed [W80]; anterior dorsal ribs with abrupt, almost right angle, ventral bend with dorsal knob at point of flexure [W80]; unique rib articulation in which posterior dorsals have extremely elongate transverse tubercular facets with ventral groove to accommodate rib [W80]; large, massive ventral rib elements, probably articulating with distal ends of dorsal ribs, in addition to gastralia [W80]; 3+ sacral vertebrae [π$03]; 1st caudal ribs arcuate, with long contact on posterior border of ilium [W80]; tail broad with a sharp down-flexure in the 8th caudal (Weems speculates an armadillo-style defense mechanism) [W80]; proximal caudals with ribs, distal caudals with fused ribs or transverse processes [W80]; chevrons short [W80]; clavicle sharply angled [W80]; interclavicle cruciate, fairly long, & flat [W80]; forelimbs unknown [W80]; ilea flare broadly anteriorly & posteriorly [W80]; pubis & ischium plate-like, with ventral curve distally but quite short [W80]; small fenestra between pubis & ischium, but obturator foramen separate [W80]; acetabulum large, deep, round & open ventrally [W80]; femur sigmoidal, head probably cartilaginous [W80]; 4th trochanter present but weakly developed [π$03]; armor laterally and dorsally, but not ventral [W80]; at least 10 parallel longitudinal columns of plates posteriorly [W80]; osteoderms sculptured [π$03]; osteoderm sculpture of scattered pits, somewhat like aetosaurs [W80]; armor plates sutured medially & laterally [W80]; plates imbricated except nuchal plate and suturally articulated sacral plates [W80]; nuchal plates "strikingly" similar to turtles [W80]; paramedian osteoderms with longitudinal bend near lateral edge [π$03]; osteoderms have elongate dorsolateral eminence as in Euscolosuchus [S92]; overlapped, anterodorsal area separated from remainder of osteoderm by distinct sulcus [S92];. Note:  There are suggestions on the web that a couple of new Doswellia papers are in the works. "[π03]" refers to our own analysis of published data. "[π$$03]" indicates a synapomorphy of the clade uniting Postosuchus and Doswellia. "[π$$$03]" indicates a synapomorphy of the clade including Postosuchus, Doswellia, and Prestosuchidae. This is also found in Ornithosuchus. Weems notes that the jaw was locked in position and would have had essentially no lateral mobility. This appears to be another variant of the large shelf found in, e.g., Erpetosuchus. Actually, it isn't prominent at all; but that's what Weems says. Links: BIOTIC PROVINCIALITY OF THE LATE TRIASSIC EQUATORIAL HUMID ZONE assemblage); VOL. 27, NO. 4 found in Pennsylvania); Revista geol ica de Chile - Redescripci del aetosaurio <I> ... possibly similar form from Chile). References: Sues (1992) [S92], Weems (1980) [W80]. ATW040104. Rauisuchidae: Fasolasuchus, Lotosaurus?, Rauisuchus. Early competitors of the dinosaurs, with more erect gait than most in the croc lineage. Quite possibly includes the Early Triassic (Olneckian) [!!] Russian form, Vytshegdosuchus and possibly Dongusuchus[GS00]. Range: Early Triassic to Late Triassic of South America, Europe, North America, East Africa, India, Russia & China. Rauisuchia :::: Poposauridae + *. Large (up to 6 m); skull tall & narrow; slit between maxilla and premaxilla, at least in juveniles [A00]; 3 sacral vertebrae; pubis and ischium more horizontal than vertical; supraacetabular shelf present (but rounded and without sharp crest) [$P93]; legs short but vertical; femoral head only slightly in-turned, but acetabulum re-oriented to come down over femoral head; as in Crocodylia, calcaneal tuber oriented posteriorly; laterally compressed foot; pes V reduced & no longer acts as lever (replaced by calcaneum); quadrupedal; dermal armor of 2 rows along trunk, above & below tail; plates linked by anterior processes; quadrupedal, terrestrial carnivores [B84]. Links: Lecture 10 - Triassic: Newark, Chinle; Untitled Document; Rauisuchia Translation and Pronunciation Guide Introduction; Postosuchus Printout- ZoomDinosaurs.com. References: Alcober (2000) [A00], Benton (1984) [B84], Gower & Sennikov (2000) [GS00], Parrish (1993) [P93]. ATW031214. Poposauridae: Bomsgroveia, Poposaurus, Postosuchus, Teratosaurus. Middle Triassic of North America. Rauisuchia :::: Rauisuchidae + *. Introduction: The Poposauridae were large carnivores closely related to the Crocodylomorpha (crocodiles and their kin). At least some forms were bipedal or capable of bipedal locomotion, much like the large theropod dinosaurs of the Jurassic and Cretaceous. One paleontologist has even suggested that the poposaurs were directly ancestral to the tyrannosaurs. Chatterjee (1985). Certainly there are a number of extraordinary similarities between the two, as indicated for example by the form of the skull and pelvis (hip-bone). Chatterjee's conclusion has been rejected by his co-workers, who point out that Postosuchus had a crocodile-like, rather than a dinosaur-like, wrist/ankle structure. Murry (1986). What seems more likely is that creatures like Postosuchus were an example of parallel evolution, the same kind of creature evolving to fill the same ecological role; a morphogenetic preview of the large theropod archetype of the great dinosaurian carnivores of the later Mesozoic. MAK991017). Characters: subnarial fenestra present (synapomorphy of Rauisuchia) [π03]; descending process of prefrontal absent [π$03]; descending process of squamosal anterior to quadrate absent [π$03]; exoccipital extends further laterally than ventral ramus of opisthotic [π$03]; exoccipital with lateral crest lying anterior to hypoglossal foramen [π$$$03]; additional foramen (posterior cerebral vein?) 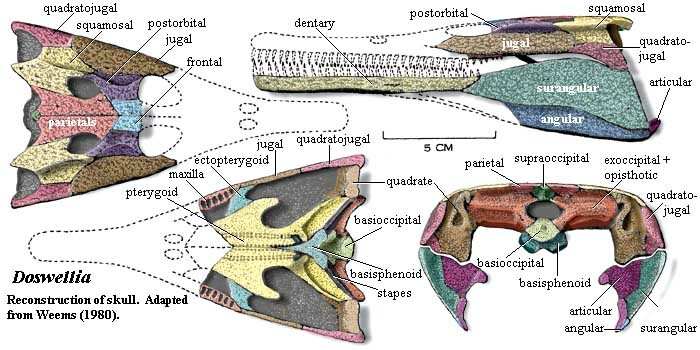 passing into dorsal surface of metotic foramen [π$03]; enlarged basipterygoid process [A00]; parasphenoid rostrum becomes dorsoventrally expanded wedge [π$03]; accessory hyposphene-hypantrum vertebral articulations [π$03]; clavicle reduced or absent [π$03]; interclavicle absent [π$03]; acetabulum open ventrally [π$03]; acetabulum semi-perforate [π$03]; prominent supraacetabular shelf [$P93]; pubis length >3x width of acetabulum [π$03]; large, posteroventrally projecting pubic boot [$P93] [π$03]; femur anteroposteriorly flattened, with wide, flat 4th trochanter extending over most of width of posterior surface [$P93]; calcaneal tuber, distal end with dorsoventrally aligned median depression [π$$$03]; pes V absent [π$03] [π$$$03]; some members bipedal [B84]. Notes:  "[π03]" refers to our own analysis of published data. "[π$$03]" indicates a synapomorphy of the clade uniting Postosuchus and Doswellia. "[π$$$03]" indicates a synapomorphy of the clade including Postosuchus, Doswellia, and Prestosuchidae. The acetabulum of Doswellia is closed ventrally, but only weakly, and the peculiar shape suggests that this may well be secondary. References: Alcober (2000) [A00], Benton (1984) [B84], Parrish (1993) [P93]. MAK000421.